The official announcement that we've been looking forward to for so long is finally here. 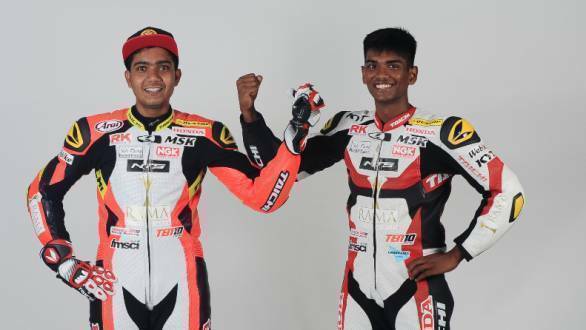 Sarath Kumar, as earlier reported by OVERDRIVE, will indeed be competing in the 2017 Asia Road Racing Championship (ARRC), riding for the RAMA Honda Racing team by NTS T.Pro Ten10. Sarath will compete in the SuperSport 600cc class of the championship, astride a Honda CBR600WR (No.69). It will be Sarath's second season in the category, although his 2016 season was largely marred by injury. Joining Sarath at the RAMA Honda Racing team is Rajiv Sethu. The Indian rider will make his ARRC debut in the Asia Production 250cc class, competing on a Honda CBR250RR (No.17). Sethu is the 2016 Indian National Motorcycle Racing Champion, and has in the past contested in the Asia Dream Cup. Both riders will be supported by Honda Motorcycles & Scooters India Pvt. Ltd and Honda Motorcycles Japan. Prabhu Nagaraj, vice president - customer service, Honda Motorcycle & Scooter Pvt. Ltd said that since India has been making progress in the field of motorsport, the fact that two Indian riders will be competing internationally in 2017 is great for the sport. He went on to say that he was confident that the riders would perform well internationally, and is also happy that they may end up inspiring other Indian racing-hopefuls in the future. "With the ARRC returning to India later this year, this will be another great opportunity for the riders as well as the motorsport fans in India," he said. Speaking of the 2017 season, Sarath said, "I am so happy to get back to riding the SS600 this year. Personally for me, 2016 was a challenging year with injuries. This season I have worked very hard and want to put up a great performance this year. Throughout my career, Ten10 Racing with Honda 2Wheelers India always had faith in me and has powered my dreams. I hope to deliver my best for them. I also thank John Sudheer who has come forward to support this sport and a talent like me". Meanwhile Rajiv Sethu said, "For any Indian racer, getting global exposure is a big opportunity. Honda 2Wheelers India has made my dream come true. I look forward to ride and learn from riders like Koyama San who is among the most experienced racers in the world. 2017 season for me is all about improving my riding and presence in international races. This is my first exposure in ARRC and it's a big deal for me. I will do my best to make my team and country proud." The RAMA Honda Racing team is a big outfit, and team owner Yusuke Teshima said that he was happy to field a team across two classes in the FIM series. The Japanese riders in the team are Tomoyoshi Koyama (No.71) who will compete in the AP250 class, moving from the SS600 class. Tiga Hada (No.23) will compete in the SS600 category. While Sena Yamada (No.17), with plenty of experience in European Moto3 and Moto2, will begin a stint in the ARRC this year. The team is backed by John Sudheer, an entrepreneur with an eye for talent. "I have been associated with the team for one year during the 2016 season and I have been to all their races and the kind of passion and commitment they have towards this sport made me decide to continue my support for the 2017 season, this time with my own brand RAMA (Royal Asia Movie Awards). I see this as a perfect platform for Asian collaboration, uniting Asia through motorcycle racing. Moreover with Indian talents involved and benefiting through this sport it is something exciting to see especially when they carry my brand across Asia."